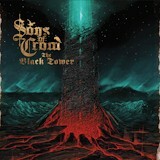 Finnish duo Sons of Crom only started their official existence in 2014, but in that same year, they released the excellent The Riddle of Steel, getting them a lot of praise. Now they're back with The Black Tower, an album that could, when they inevitably remake the Conan movie, could be the perfect soundtrack for it. The mood of dark, solemn heroism, of battles fought far away in a time-dimmed age, is present throughout, whether the songs are composed of ferocious black metal blasting or heavy, Manilla Road-style soloing. They use both, and more besides. The Black Tower is the distillation of a lot of heavy metal concepts into a single delicious liqueur. Hoarse-voiced Viking choirs are everywhere, chanting heroic sagas in the background to the sound of furious black metal riffing, such as In Fire Reborn, or just on their own in Nordland-inspired acoustic folk ballads. On the other hand, there are very few harsh black metal vocals used -- only in small quantities. Somehow, Iiro Sarkki and Janne Posti manage to sound tougher and more authentic without them, and when they are used, the effect is intensified. They also know how to write a crunching epic melody or two. The guitar riffing of Summoning the Starborn starts with the crunching heaviness of its predecessor, but speeds up for a short time into tremolo-picked fury, smoothly moving onto a full epic symphony. Viimeinen Laki, a smooth marching song with double-kicked drums buried deep in the mix, is especially worthy of note, with the aforementioned choirs overwhelming the song but countered by croaked responses and luxurious guitar solos. Ultimately, it's the straightforward honesty of the band's sound, together with their atmospheric prowess, that makes this a must-listen. No nods or ironic winks at the listener -- just serious, epic heavy metal of the Howard-inspired, Bathory-founded kind. In the middle of a hot August, you can feel the chill of the mist in Foreverdark Woods.